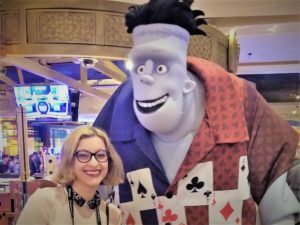 CinemaCon 2018 took place at its usual beautiful grounds of Caesars Palace, Las Vegas, NV in April 23-26, 2018. 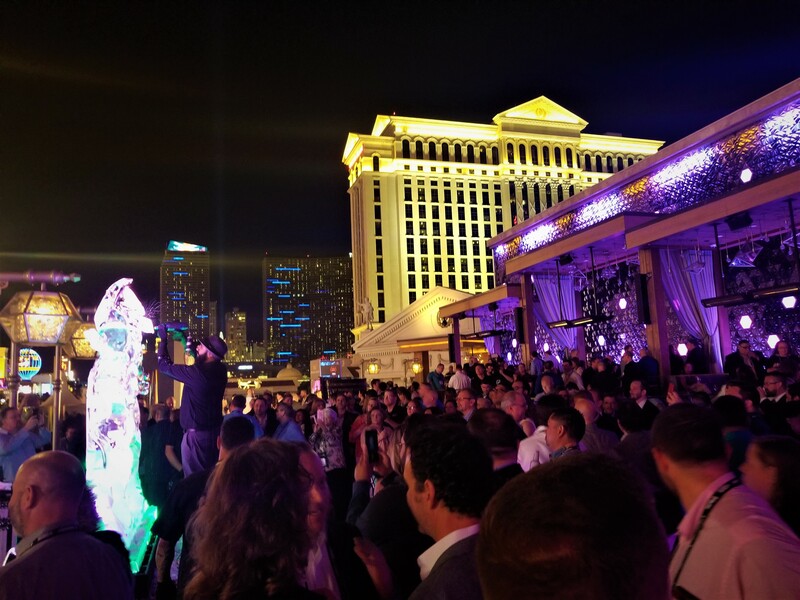 It was a busy and luscious and extravagant (as always) networking event for all film industry representatives – from movie theatre operators, to film content creators, editors, service providers (that’s us, yay! ), vendors, journalists, members of NATO and ICTA and many more. 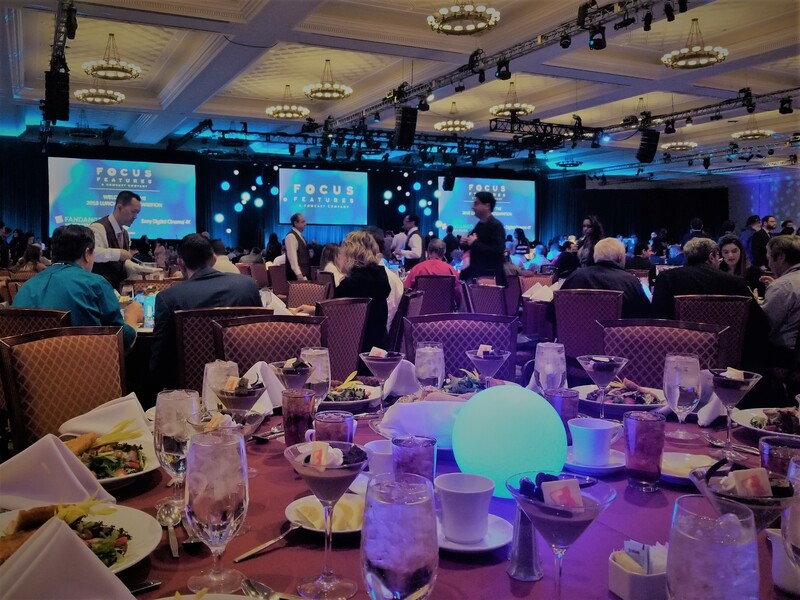 TK Architects definitely remained busy with the conference (and we are just now trying to catch our breath after the whirlpool of tradeshow-floor action, non stop seminars, intrepid networking, lead and contact follow ups and “star”gazing euphoria). 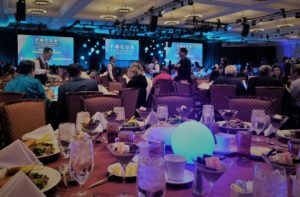 So, here are a few takeaways by TK Architects from 2018 CinemaCon. 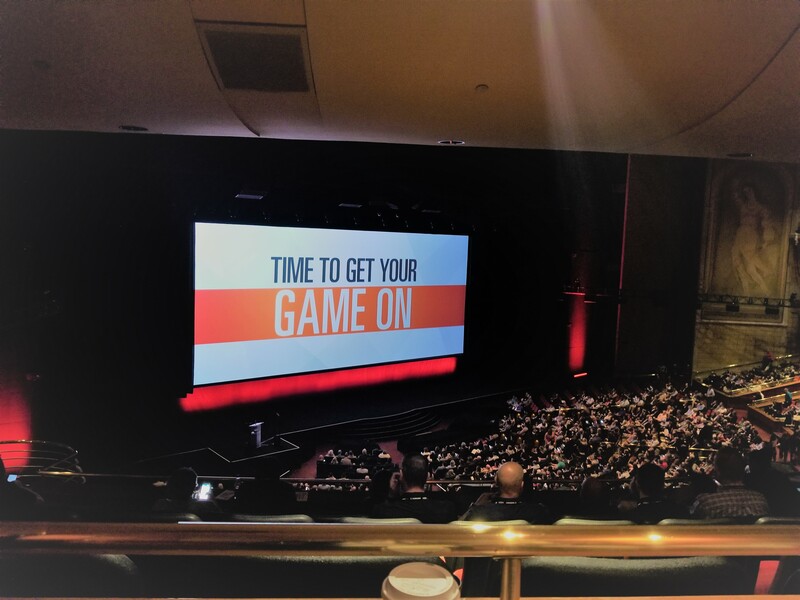 CinemaCon is where people come to hear of the cinema industry updates, learn about new-comings, where we stand and what to expect from the industry. And so we did. We came to hear, but we also came to tell you what is new with us. 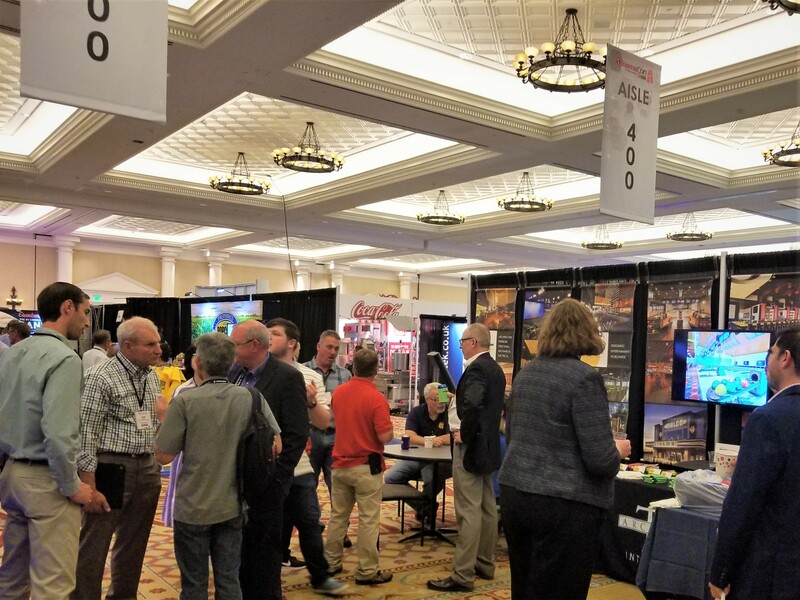 TK Architects had a good showing at the tradeshow and loved to see all of you, old and new friends, at the conference events and at our tradeshow booth. We are thankful for each of you who had taken a minute to stop by our booth to see what is “cooking” in our creative TK pot, or met with us at other activities. 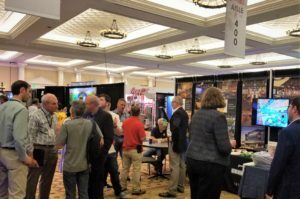 The tradeshow seemed to be busier this year, especially in between the conference presentations and viewings, which is always a good sign of positive future of the industry. The main message at the conference this year was that the industry is alive as ever, vibrant and going strong. Despite of a few disruption referrals (no naming, even though MoviePass and Netflix were definitely on everyone’s mind), we should remain optimistic about the industry, as it has been going at full force (and numbers do not lie!). Fear not, a new study has shown that people who consume a lot of content do so across multiple platforms. NATO reported that according to a recently conducted study by Ernst &Young 33% of moviegoers who see nine or more movies per year also spend 15 or more hours per week on streaming platforms. The social aspect is still vibrant and alive. Most still appreciate the movie going experience, and theatrical experiences and viewings are a continuous and promising trend. We are hoping for peaceful co-existence and balance between streaming and theatrical. 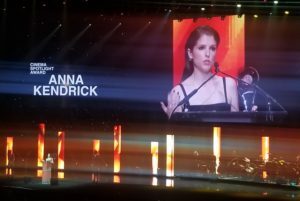 As an example, Amazon had a strong showing at CinemaCon, presenting for the 3rd year in a row. Although subscription services have been brought up quite a few times during the on stage conversations, we do agree that as long as John Fithian’s main concerns (sustainability, accuracy and data privacy) are met, the models should work for exhibitors to attract more moviegoers to the cinemas. The numbers at the NATO president John Fithian’s state of the industry address allowed for positive future planning. North America remains the biggest global cinema market with its 30% of global revenue (from only 5% of population) in 2017. And globally the industry reached its first 40 billion in 2017. The global box office has grown by 17% since 2012, with many emerging markets, such as the big recent news of cinema market expansion to Saudi Arabia this year. 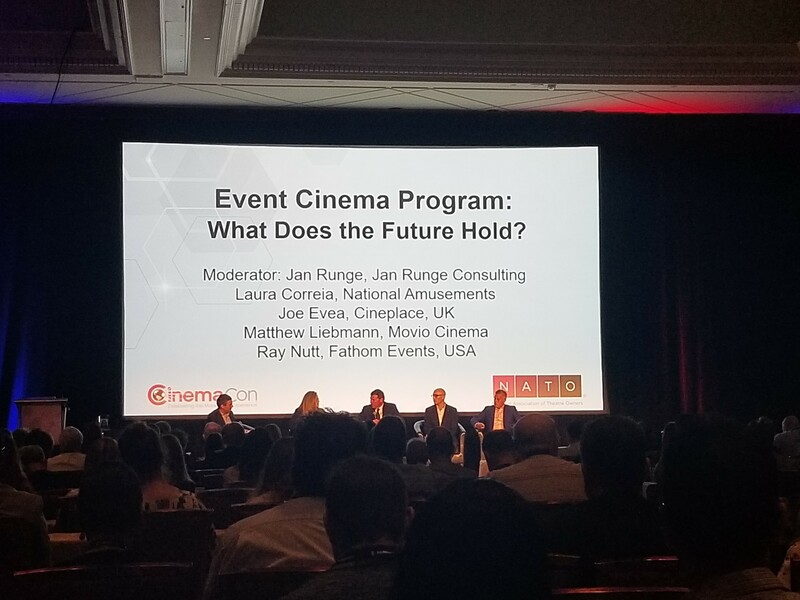 It was exciting to hear positive news from the newly formed Global Cinema Federation at CinemaCon, formed with 2 trade associations and 12 leading exhibition companies from around the world, who have a lot of great ideas for the upcoming year. This year has started strong, with the first $1billion hit open in February- the Black Panther, and a very strong showing of Avengers: Infinity War. The summer of 2018 has presented a strong promising slate of wonderful films and diverse content, and so does the rest of the year. Technology (such as VR, digital ticketing innovations, premium formats- new 3D/4D and LED screen technologies and newer laser projector experiences) and the ongoing interest in augmented social experiences (Family Entertainment Centers, gaming or more social gathering spaces, additional F&B services etc) at the theatres were ongoing themes as well. Some of us on TK Architects team were able to experience all the cool new laser projector, screen & lighting technologies presented at Barco, Dolby, GDC, Christie, NEC, Sony, Samsung presentation suites or at both tradeshow floors. CJ 4DPLEX announced partnership with Warner Bros and Fox for future content for movies such as “Aquaman” and have bright plans for the upcoming year. 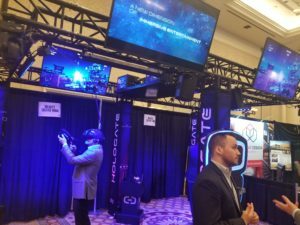 GDC Technology’s GoGoCinema and NAGRA Kudelski also unveiled new plans for their on-demand alternative distribution platform solutions. All while Christie displayed its wide range of illumination technologies, including state-of-the-art RGB laser projection systems. Barco has presented an innovative Vision 2020 concept that allows impactful and powerful high contrast and brightness on screen. In fact, Barco made an official introduction of their newly formed brand while at the show – Cinionic, a collaboration between three founding partners Barco, Appotronics (laser technology) and CFG (premium cinema solutions). The name Cinionic combines the word “cinema” and “ionic” and signifies the perfect blend of culture and diverse services that the partners bring to the mix. A few of us have been lucky to try out the latest VR & gaming experiences (such as by Hologate-Creative Works) right on the tradeshow floor (and honestly had a ton of fun in a process), and we look forward to incorporating these and other elements in our cinema design. 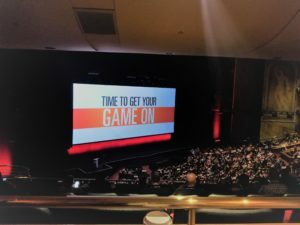 The conference attendees were presented a wonderful lineup of movies that is awaiting the cinemagoers in 2018 – 2019. This year 11 movie studios presented their films, each with a busy and unique presentation program and teasers. 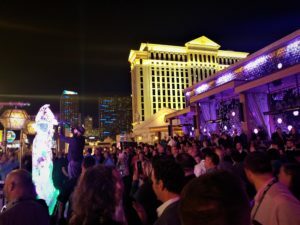 Among some of the film presentations that stood out were: Amazon’s Beautiful Boy and Suspiria (a beautiful but quite disturbing preview that forced many to leave their chicken uneaten on a plate), Lionsgate’s The Spy Who Dumped Me (with an interesting murder-act scene of its performing cast on stage & Ryan Reynold’s new gin advertisement by Blake Lively), Walt Disney’s diverse Aladdin and amazingly beautiful Lion King that presented strikingly modern CGI technologies that we will see in July 2019. 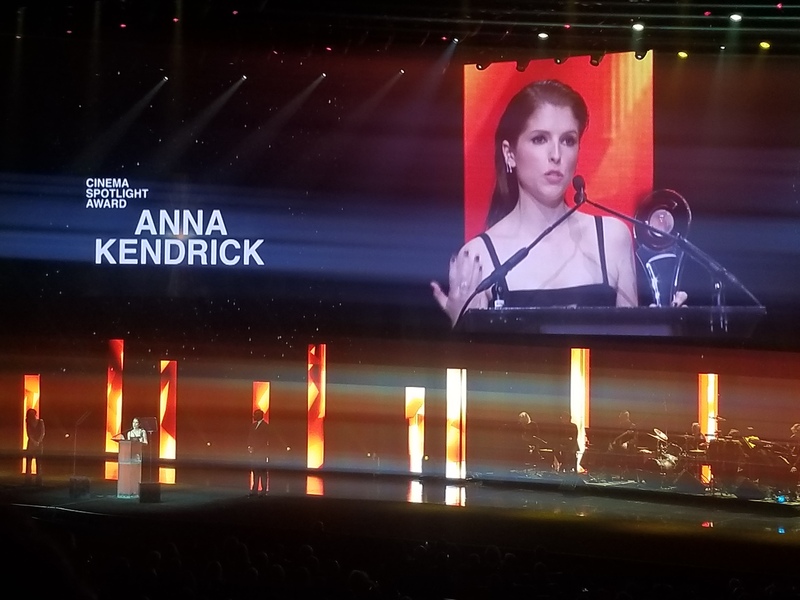 Besides the ability to view the fresh lineup of movie trailers and to hear motivational words about the industry, one of the other perks, is film star appearance on stage to present the films or to receive the awards. 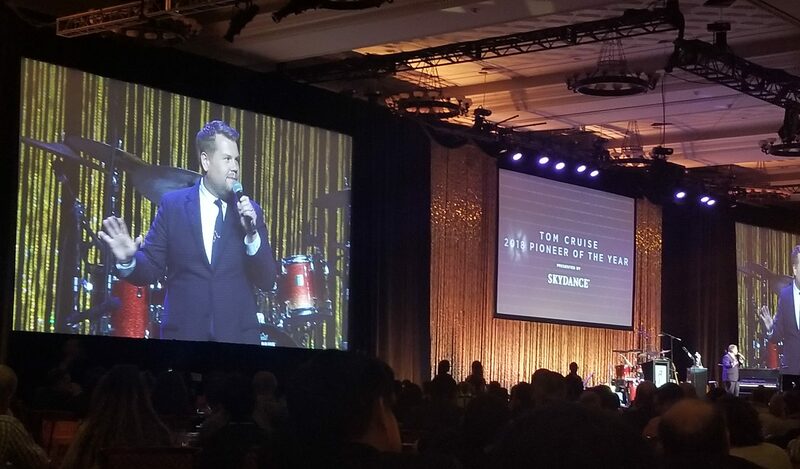 We tried as hard as ever not to get star-stricken, but having Tom Cruise laughing at James Corden’s jokes just a few tables away from you with Leslie Odom, Jr (Hamilton) singing at Pioneer of the Year Awards dinner, is quite an experience, however you twist it. TK Architects reported to have seen the following other celebrities this time around: Will Ferrell (we hope his luck rubbed off on us, as he claimed to had won 50k at casino earlier), Saoirse Ronan, Steve Carell, Timothee Chalamet, Dakota Johnson (Female Star of the Year), Johnny Knoxville, Taron Egerton (Action Star of the Year), Samuel Jackson (Cinema Icon Award), Quentin Tarantino, Leonardo DiCaprio, a very humble and sweet Tiffany Haddish (Female Star of Tomorrow) , Kevin Hart, Blake Lively, Tom Hardy, Riz Ahmed, Anna Kendrick (Cinema Spotlight Award), Michelle Williams, Fede Álvarez, Benicio del Toro (Male Star of the Year), Trevor Jackson, Jason Mitchell, Anthony Mackie, Matthew McConaughey, Gina Rodriguez, Director X, Claire Foy, Kate McKinnon (Comedy Star of the Year) , Mila Kunis, Jack Black (CinemaCon Visionary Award), Felicity Jones ( Award of Excellence in Acting), and hilarious Lil Rel Howery (Breakthrough Performer of the Year) among a few others. Big warm Congrats to this year awardees! A great and diverse variety of talent in 2018 CinemaCon. We are happy to share the positive movie industry message with you and remain very optimistic about the cinema industry’s future.